England pair Joe Root and James Anderson broke the all-time test record for a 10th-wicket partnership on Saturday but the first Test against India at Trent Bridge looks like ending in a draw. The home team took an unlikely 39-run lead on first innings after Root and Anderson combined for a remarkable stand of 198, beating the previous Test best by 35, to lead their side to a total of 496. 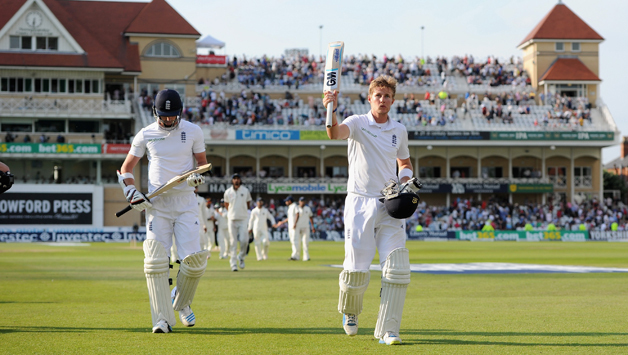 England then grabbed two late wickets to reduce India to 167 for three at the close of play. India ended Day 4 with a lead of 128 runs with 7 wickets in hand. Despite starting well in the second innings, the Indians lost two tickets of Vijay and Pujara in successive balls. Virat Kohli and Ajinkya Rahane had to survive a tense final few overs. Both batsmen were untroubled and saw the day through without any scare.